Marty McFly and Emmett Brown, eat your heart out. The world’s first autonomous flying taxi has made its maiden flight in Dubai. 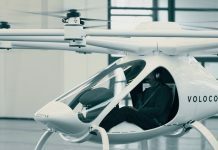 The electric two-seat craft, made by German firm Volocopter, will be used for the world’s first pilotless taxi service to be introduced by the Dubai roads and traffic authority in about five years as part of Dubai’s bid to be the world’s smartest city. It hopes that the aircraft will handle 25 per cent of passenger journeys in the city by 2030. 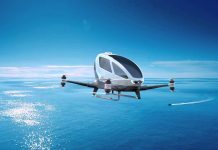 Volocopter’s investors include German automotive giant Daimler, which has put 25 million euros (about $A37.4 million) into the company. The test flight was witnessed by the Crown Prince of Dubai, Sheikh Hamdan bin Mohammed bin Rashid Al Maktoum. 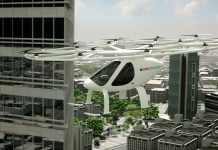 According to a Dubai RTA media release, the prototype air taxi is environmentally friendly and quiet. It has a maximum flight time of about 30 minutes at a cruise speed of 50 km/h, (27 kt) with a maximum airspeed of 100 km/h (54 kt). The vehicle is about two metres tall and the diameter of the rotor rim, including the 18 propellers, is seven metres. Over the next five years, the RTA will collaborate with United Arab Emirates and Dubai Civil Aviation Authority to develop operational policies and procedures, including aircraft certification, safety and security standards, routes and landing points. Will the last generation of pilots, bus drivers, taxi drivers, truck drivers, fork lift operators, etc., etc., please stand up for your final bow? Will not happen on a large scale ..only for some elite who also need to be fearless.